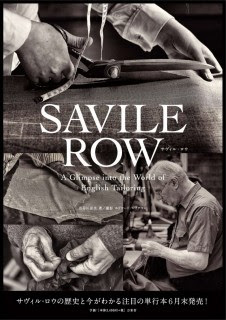 Yoshimi Hasegawa recently sent me her beautiful book Savile Row: A Glimpse into the World of English Tailoring. It is largely in Japanese, but each tailor’s chapter includes a section in English and there is also a short English introduction. Indeed, the Military Tailoring section of the introduction is the most interesting thing in the book. Although short, it includes three examples of military jackets – a patrol jacket, a khaki drill jacket and a mess jacket – demonstrating the range of such apparel any military man required. As Edward Lakeman, who writes this section, says, in this age reputations could be worn or lost on the strength of your tailor. The photography throughout is gorgeous, black and white and in high contrast, with a particular penchant for close-ups of buttons, sheers and cloth. There are, however, a few things I would quibble with. Spencer Hart is included among an otherwise standard list of bespoke tailors. The directory at the end includes Scabal, Dormeuil and Ozwald Boateng in a slightly more expanded list. And the address of Timothy Everest is the west end branch on Bruton Street, which does not of course handle the bespoke. The book is wonderful compliment to the Row. Although it adds little to James Sherwood’s larger volume, it is apparently the first such work created for the Japanese market and as such will I’m sure be enthusiastically received. It is currently available through Amazon Japan, priced ¥3,570 (£28). You can follow the discussion on Savile Row: A Glimpse into the World of English Tailoring by entering your email address in the box below. You will then receive an email every time a new comment is added. These will also contain a link to a page where you can stop the alerts, and remove all of your related data from the site. Firstly, thank you so much for introducing my book and your valuable thought. I fully understand your question about the fact that some tailors are not typically Savile Row tailors. However, I would like to describe the relationship between Savile Row and music (eg.Tommy Nutter) and film (eg.Oscar), the comparison of the glorious days to the present situation, and most importantly, how the media and the economy give influence to Men’s fashion and Savile Row. It is because that part is never explained properly in Japanese books. I am very pleased to know that you enjoyed my book, and once again, thank you very much for taking your time to review my book.